During the months of May and June 2017, 3 simultaneous hospital outbreaks of MERS-CoV were reported from 3 different hospitals in Riyadh city, Riyadh Region in Saudi Arabia, of which 2 clusters are related. A total of 48 cases with 6 related deaths were reported from these 3 hospital clusters (CFR: 12.5%). The date of reporting of last laboratory-confirmed case from these 3 hospital clusters was 17 June 2017. The most prolific author of studies on MERS-CoV is undoubtedly Dr. Ziad Memish; former (until 2014)Deputy Minister of Health for Saudi Arabia (see An Unexpected Announcement From The Saudi MOH). Last week - in Frontiers Med. : MERS-CoV In 7 Pediatric Patients - we looked at one of his recent papers that detailed 7 pediatric MERS-CoV cases. Today, we get a double dose from Memish et al., with studies appearing in two journals; the AJIC (American Journal of Infection Control) and the IJID (International Journal of Infectious Diseases). While both are related - they each look at different aspects of the 2017 Riyadh Hospital MERS Clusters. The first is a more detailed summary of the KSMC outbreak than we've seen previously, which explains how an unusual presentation and delayed diagnosis led to so many HCWs and patients being exposed. HCF outbreaks of MERS-CoV continue to happen but with lower frequency and size. Outbreaks are being ignited with unusual challenging cases that are difficult to pick up in emergency room (CRF and Chronic Heart Disease). Superspreading events are multifactorial with host, virus and environment playing key role. Point of care testing is the highest priority in limiting such cases in the future. The hallmark of Middle East respiratory syndrome coronavirus (MERS-CoV) disease is the ability to cause major health care-associated nosocomial outbreaks with superspreading events leading to massive numbers of cases and excessive morbidity and mortality. In this report, we describe a patient who presented with acute renal failure requiring hemodialysis and became a MERS-CoV superspreader, igniting a recent multihospital outbreak in Riyadh. Between May 31 and June 15, 2017, 44 cases of MERS-CoV infection were reported from 3 simultaneous clusters from 3 health care facilities in Riyadh, Saudi Arabia, including 11 fatal cases. Out of the total reported cases, 29 cases were reported from King Saud Medical City. The cluster at King Saud Medical City was ignited by a single superspreader patient who presented with acute renal failure. After 14 hours in the open area of the emergency department and 2 hemodialysis sessions he was diagnosed with MERS-CoV. 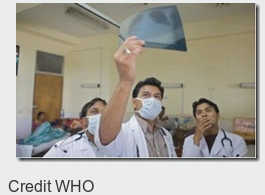 One hundred twenty contacts who had direct unprotected exposure were screened. Among those contacts, 9 out of 107 health care workers (5 nurses, 3 physicians, and 1 paramedic) and 7 out of 13 patients tested positive for MERS-CoV. This hospital outbreak demonstrated the difficulties in diagnosing pneumonia in patients with renal and cardiac failure, which leads to delayed suspicion of MERS-CoV and hence delay in applying the proper infection control procedures. In MERS-CoV endemic countries there is an urgent need for developing rapid point-of-care testing that would assist emergency department staff in triaging suspected cases of MERS-CoV to ensure timely isolation and management of their primary illness and prevent major MERS-CoV outbreaks. The second study, appearing in the IJID, calls for more stringent testing of all HCW contacts of MERS cases, something which we've discussed often in the past. For the first few years the Saudis treated `asymptomatic' RT-PCR positive MERS-CoV test results (usually discovered while contact testing during a hospital outbreak) as something `less' than a MERS case. They were rarely reported, and were not included in their official MERS statistics. That is until the World Health Organization issued a particularly strong rebuke (without singling out the Saudis) on the handling of asymptomatic cases in their 2015 WHO Statement On The 10th Meeting Of the IHR Emergency Committee On MERS. Since then, we've seen a substantial jump in the number of `asymptomatic' (or perhaps, mildly symptomatic) cases reported out of Saudi Arabia. As discussed previously, there remain serious questions over how one defines `symptomatic’. Are `sniffles’ considered symptomatic? Malaise? Is there a specific fever threshold? Are non-respiratory symptoms (gastrointestinal, renal failure) counted? While the source of many MERS infections are self evident (camel contact, household contact, hospital acquired), for many we simply don't know how an individual was exposed. While mild or asymptomatic transmission may be responsible, for now that remains largely unproven. Which brings us to the second (open access) study, which calls for stricter repeated screening of all contacts of MERS cases in the hospital, regardless of the degree or duration of contact, or their lack of symptoms. MERS-CoV continues to cause frequent hospital outbreaks in Saudi Arabia with emergency departments highlighted as the initial site of the spread of this virus. Superspreaders have always played a critical role in propagating healthcare facilities outbreaks and more recently asymptomatic HCWs are identified to play a role. Evidence to date supports liberal testing of all HCWs in close contact with MERS-CoV positive cases irrelevant to the significance of contact or presence or absence of symptoms with the need for repeat testing. Need for urgent review of all guidelines allowing return of asymptomatic positive MERS-CoV HCWs under investigation to active duty. MERS-CoV continues to cause frequent hospital outbreaks in Saudi Arabia with emergency departments as the initial site of the spread of this virus. We assessed the transmission risks of MERS-CoV infection to HCWs in an outbreak in Riyadh. All HCWs with unprotected exposure to confirmed cases were tested after 24 hours of exposure. Two negative results for MERS-CoV 3 days apart and being free of any suggestive signs and symptoms were used to stop their isolation. Overall 17 out 1223 HCWS with different level of exposure tested positive for MERS-CoV. Of the 15 positive HCWS with adequate follow up, 40% (6/15 HCWs) tested positive on the first sampling & 53% (8/15) tested positive on the second sampling. While the range of time to negative results among the 15 positive HCWs was between 4 to 47 days (average of 14.5 days) and on average infected HCWs needed 2 samples for clearance. All positive HCWs were either asymptomatic or had mild disease. The data supports the liberal testing of all close contacts of MERS-CoV cases irrelevant to the significance of contact or presence or absence of symptoms. In addition, urgent careful review of guidance allowing return of asymptomatic MERS-CoV positive HCWs under investigation to active duty. Five years after the disease emergence we have gained significant new knowledge, but some gaps and challenges remain including: the definite source of infection and the exact routes of direct or indirect exposure, how to predict superspreaders, clear guidance on handling exposed HCWS who can act as a disease carrier spreading it to others, and finally how to detect cases early in the emergency room with the development of rapid, easy to use, highly sensitive and specific point of care testing. In an effort to prevent any unnecessary risky exposures of HCW and possibly compromising HCWs & patient safety by propagating healthcare associated outbreaks, the available evidence to date supports the 2015 WHO guidance in its call to be liberal in testing all “close contacts” of MERS-CoV cases irrelevant to the significance of contact or presence or absence of symptoms and the need for repeat testing weekly till negative and every 24-48hrs for release from isolation. In addition, urgent careful review of guidance allowing return of asymptomatic MERS-CoV positive HCWs under investigation to active duty. All public health guidelines, especially ones addressing emerging pathogens of international public health importance need to be regularly updated based on new scientific evidence and areas of ambiguity need to be addressed with focused research initiatives by countries affected. A reminder that infection control in a hospital environment is always more challenging than we expect, and that what you can't see can hurt you.